Website reincarnation? New HomeQ launched! We came up with a great idea on Friday. While we've launched the new MyProperty website just over a week ago and our R&D team is busy tweaking it further as we speak, are we going to throw away the old MyProperty website completely? The new MyProperty websites was a complete redesign in many ways to cater for an ever increasing demand in traffic and new web technologies: we're doing the SEO differently, the site was build on Microsoft's .NET framework 3.5, we're now using SQL Server 2008, we're integrating with social networking apps like Twitter and Facebook and for the first time, MyProperty was a team rather than a one-man development effort. 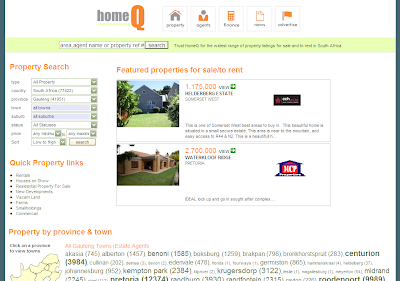 Although MyProperty still enjoys top ranking in Google for popular keywords such as 'Property in South Africa', we thought it would be a great idea to still keep the old website alive, and enjoy the additional stream of top SEO referral traffic for property searches. Nothing special in that name, we just wanted something "short-and-easy". Now search engines need to completely re-index the website under the new domain which will take some time - but it is worth a try, and our gut feel says it will work and provide additional traffic for our real estate clients. The 'new' property portal is operational and feeds directly from our OMS management system.